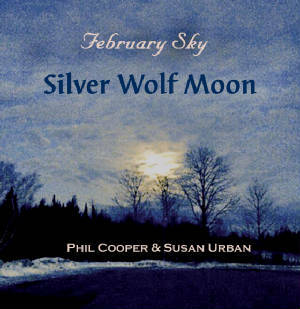 Silver Wolf Moon is available for purchase from this website or at gigs. Very shortly it will be available at CD Baby and various online outlets. Purchase Silver Wolf Moon here for $15 including postage! Purchase Ain't No Sangin' here for $15 including postage! Goldenrod is available for purchase from this website or at gigs. Samples from the recording are HERE. The lyrics are HERE. Purchase Goldenrod here for $15 including postage! Time-Honored Pathways is available for purchase from this website or at gigs. Samples from the recording are HERE. The lyrics are HERE. Purchase Time-Honored Pathways here for $15 including postage! FEBRUARY SKY CD – Our first (self-titled) CD is still available for purchase at CDBaby! http://cdbaby.com/cd/februarysky Here is a link to a very nice review of this CD at Victory Review Acoustic Music Magazine! OR you can order directly from us through PayPal for $15 including postage and handling - just click on the button. Here is a list of the tracks that are on it. Or come out to one of our gigs and you can get it in person! You can listen to some of the finished cuts here, and you can get the lyrics here.